Birkheads Secret Gardens are not secret due to the fact that you can find their leaflet in most tourist spots in the North East of England however if you drive through the sprawling suburbs of the Borough of Gateshead you will eventually come to some narrow country lanes where the landscape opens up on a series of high points and nestled in this is Birkheads itself away from any other habitation. You know you are in the countryside as there is a sign in the toilets saying that as you are now in the countryside you are off mains and please treat it gently. All this adds to the quirkiness of the place. It is not a National Trust property or one owned by a chain but the private property of Mike and Christine Liddle and their personal touches are everywhere. You are very likely to met by Christine herself in the shop. A gentle note at the gate of the garden reminds you that you need a ticket to the garden but the visit to the shop, cafe or nursery are free of charge. Christine is very friendly and we had a chat about box blight which, sadly is quite a common-place conversation I have with owners nowadays. The gardens themselves are done in a series of sectors. Some can be classed as garden rooms as you would see at Hidcote Manor but some are open spaces such as the bluebell and daffodil copse and the goose meadow. Christine told me that one visitor had bemoaned the fact that the grass had grown too tall in the wildflower meadow, somewhat missing the point. Sadly neat suburban gardens with grass cut within an inch of its life are the standard by which many view gardens. The whole space was a field and I suspect the Liddle’s have created each space separately over the years since they started in 1987. 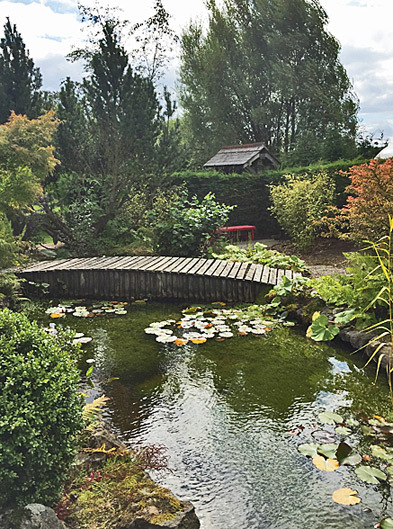 There are some brilliantly quirky spaces such as the Meditation garden which a Japanese style pond and even a Buddha and a bell. 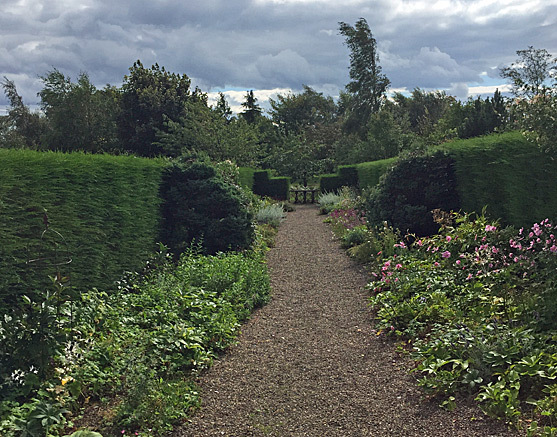 These smaller gardens are bounded by leylandii hedging. 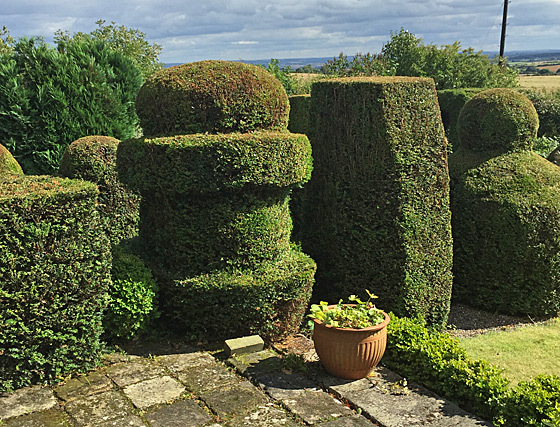 This works as they have been kept well clipped and shaped over the years and would provide inspiration to anyone wanting to try something similar in their own plots. 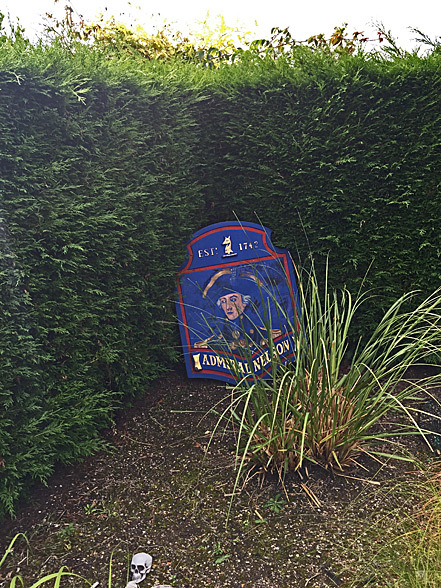 I particularly love the Treasure Island Garden which has an old pub sign for the Admiral Nelson in it plus sea shells, a lifebelt and even some dead man’s bones. Even if you only have a small garden you can let your imagination run riot having seen this example of perfect symmetry between plants and objects. Around the gardens you will see other personal ideas. Instead of removing an old tree stump the owners have built a model tree house on the top of it complete with slates and painted windows. This will impress the children probably as much as it impressed an old man like me. 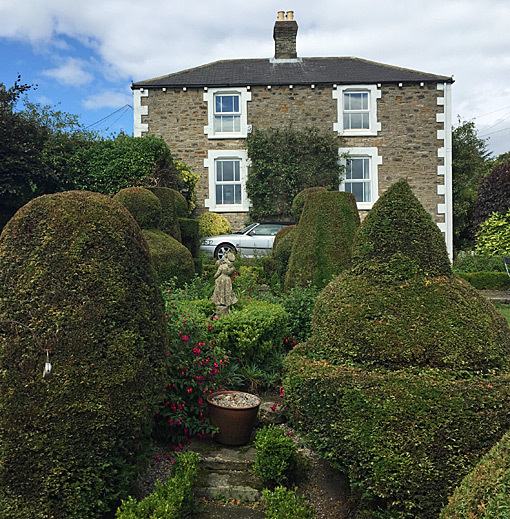 But of course its topiary and hedging we want so if you follow the course that is described to you in the shop and on the map you are given you will come to The Avenue first. This has hedges with flying buttresses not dissimilar to those at Biddulph Grange with flower borders on either side. There is also a large cone of Lonicera Nitida to see which shows that not everything has to be yew or box. After you have done the lower gardens you come back to the main entrance and cross the car park path and go through a gate marked private on your right. It’s OK, you have the owners permission if you have paid your money. 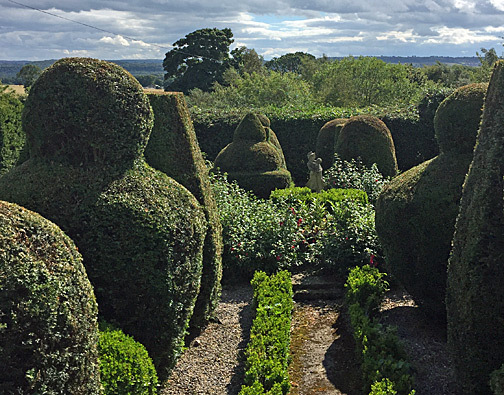 The topiary garden nestles between the house and the separate block which houses the cafe and the toilets. You suddenly come upon it and it is a delight. Just the right size for the house which provides its backdrop. 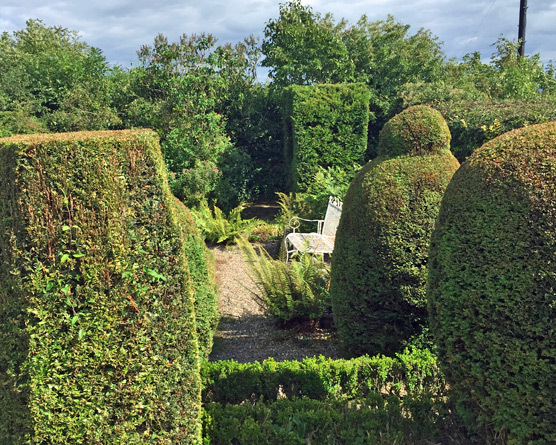 The yew specimens are well clipped and formed into geometric shapes. They are mainly pillars with balconies sometimes topped off by balls or finials and look as if they were one of the first plantings to be done when the owners moved in. 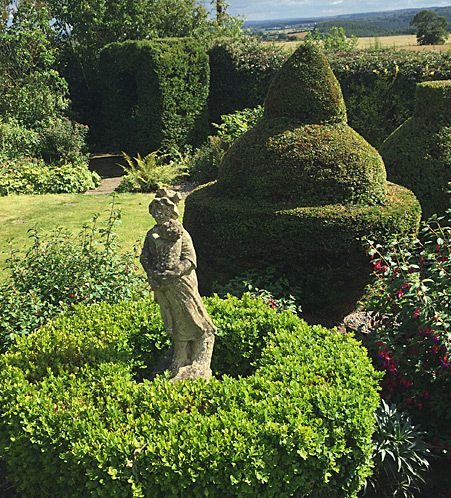 There are little paths and paved areas and stepping stones across a lawn so that you can get at the yew topiary from every angle and some of the best views are to be had from high up looking out over the open countryside. There are also benches to sit and relax and on summer days you can come out of the cafe and sit drinking your coffee overlooking the topiary garden and this is a delight. 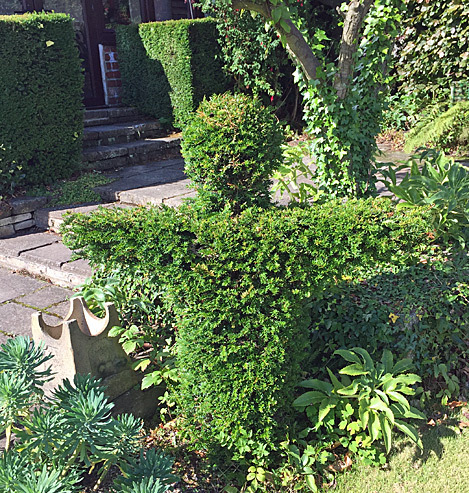 You will also find a new topiary person who perhaps stayed there a while too long. I don’t think the Birkheads Secret Gardens will be secret for too much longer. Go and have a look as this is one of the few public gardens that you could adapt some aspects of it for your small urban space if you have one. Everything is done on a human scale and is well worth seeking out.